of the living rooms of the average English home; and he was perfectly right in coming to that conclusion. He, therefore, set himself to create an Anglo-Chinese style on his own account, and one, withal, which might be rendered in his beloved mahogany ; one which would not only have sufficient stability of construction to inspire confidence in the minds of those for whose use it was intended, but which would, at the same time, appeal to their taste for novelty. The principal feature of this phase of " Chippendale" is, of course, the ever-present lattice work, to which it owes whatever measure of Chinese character it may possess, and in the invention of which this designer displayed not a little ingenuity. 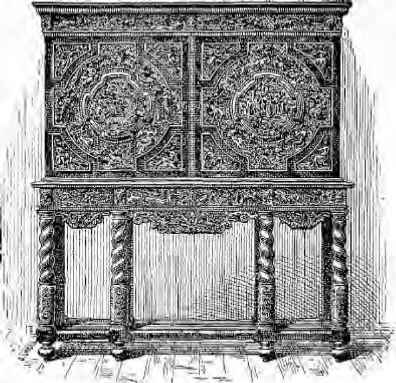 If we consider the " Chippendale-Chinese " chairs first, in order to avoid all possibility of misunderstanding or confusion, it must at once be made clear that their general form differs very greatly from that of those which we have already studied; whereas we shall see that there is little or no radical variation in the constructional outline of the cabinet work. The small " Horse" screen on Plate IV. ; the first of the two chairs on Plate V.; the two lower cabinets and the chair on Plate VI. ; the upper arm-chair and "small" chair on Plate IX. ; the two chairs and table on Plate X.; and two chairs on Plate XI., are admirable examples of this style; and with their forms and detail " in our eye," there can be no possible difficulty in deciding what is "Chippendale-Chinese" and what is not.